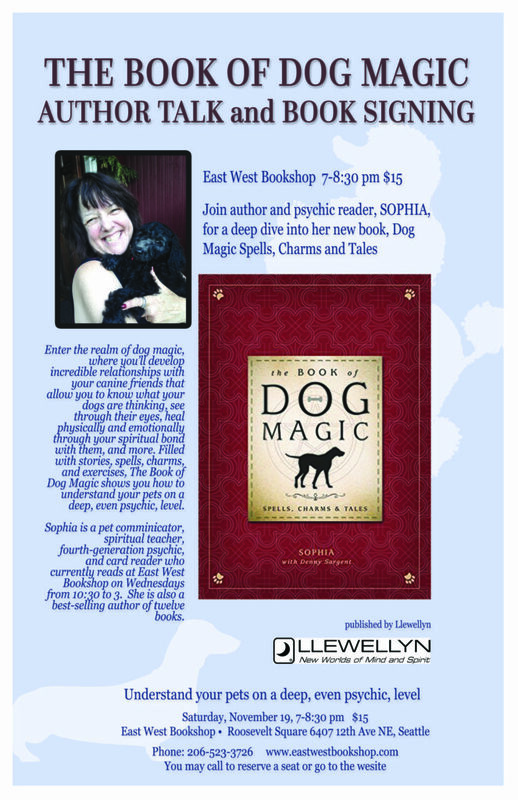 Join us fellow dog-lovers to discover the hidden world of dog magic and bond with the spirit of your canine companion! Dogs have been part of things spiritual since they first scared away phantoms from Neanderthal campfires. Divine canines have been used for thousands of years to magically heal, protect people and develop psychic powers. Shamans, priests and magic makers throughout history have worked with dog-spirits, and powerful canine partners to accomplish their spiritual quests and workings, why shouldn’t you? Join us for a brief overview of Dog Magic throughout the ages followed by an actual Dog Empowering Spell for you and your dog to call upon your ‘guardian spirits’ and so become calmer, happier and more spiritually bonded. Join author Sophia and as we explore the history, mythology, and cultural impact of canines. Discover magical techniques to teach obedience, invoke your dog totem, and connect with a dog in the afterlife. You and your furry friends will love this comprehensive, easy-to-use guide. Sophia’s grandparents taught her how to be a psychic and use her intuitive powers in a number of different ways. Through them Sophia mastered many kinds of divination, such as, playing card readings, crystal ball readings, tea leaf and coffee ground readings, to name a few. Also her grandparents trained her in the art of being a medium. She regularly teaches workshops and classes on many of these subjects and gives professional readings. Sophia is a popular best selling new age author and ceramic artist. Sophia is also an animal intuitive and world-wide traveler, she has the ability to call wild animals to her where ever she goes. Share your dog magic with us!